[Image: An Australian truth window, photographed by Peter Halasz, courtesy of Wikipedia]. "Truth windows" are false windows cut into the interior walls of buildings, used to reveal what lies within that wall and, thus—like something out of an architecturally themed remake of The Matrix—what the building you're standing in is really made from. According to that well-known fast-research assistant Wikipedia, "truth windows" are "often used to show the walls are actually made from straw bales. 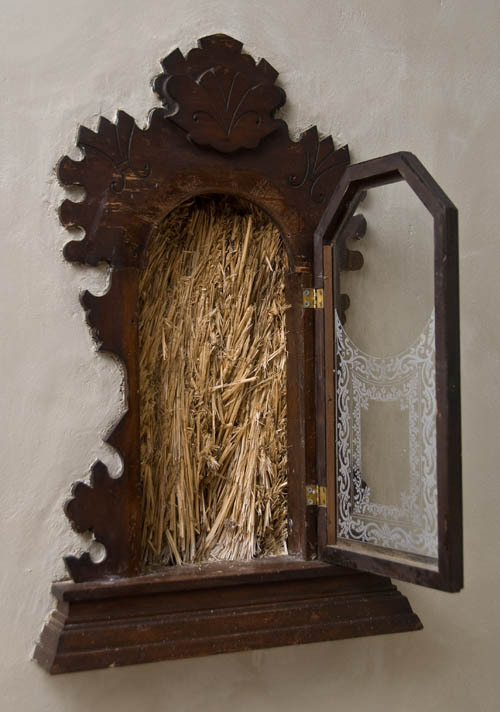 A small section of a wall is left unplastered on the interior, and a frame is used to create a window which shows only straw, which makes up the inside of the wall." The ideological implications of this—let alone philosophical ones—are quite extraordinary, as if we could simply scrape aside some paint and plaster and see, for once, the truth, the Real, the scaffolding, the code that makes and sustains the everyday worldly environment; though, I suppose, any attempt to over-literalize such a thing—even the portentous, Frodo Baggensian name of a "truth window"—would come out as, well... exactly like an architecturally themed remake of The Matrix (perhaps resembling the unwatchable film Dark City). Though that's not to say that someone shouldn't try. But "truth windows" aren't limited to architecture. Briefly, I remember as a kid being taken out to visit a farm somewhere in the University of Wisconsin system to see a so-called "cannulated cow," or a cow with a window in its side. As The Lantern describes this sectional phenomenon, "Basically, the animals have surgery performed upon them that creates a passageway in the side of the animal so researchers can perform readings on what takes place in the cow's rumen." 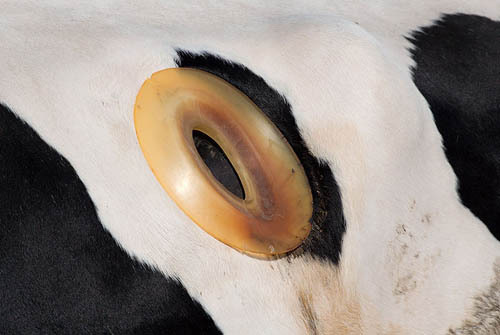 [Image: A cow window, photographed by "Dori," courtesy of Wikipedia]. Alternatively, I've long been intrigued with the idea of installing upside-down periscopes on the sidewalks of vertically dense cities such as New York City, London, Istanbul, or Jerusalem—even Washington D.C., where road construction recently revealed the laminated stratigraphy of older roads beneath Georgetown—allowing everyone to peer down into subterranean infrastructure, exploring subways, cellars, plague pits, crypts, sewers, buried rivers and streams, scanning back and forth through the foundations of missing or war-destroyed buildings, even zeroing in on lost ships. Call it cannulated urbanism, perhaps, or archaeological "truth windows" installed like skylights in the ground. ever since I heard about Truth Windows, I've wanted to install one in my (non-strawbale) house. It wouldn't be hard to fill up a space between studs with straw and then drywall over it, right? Here is a truth window of sorts, in skylight-in-ground format. Thanks, Matt! I was actually reminded of Bebelplatz while writing this; I've spent about 7-8 months in Berlin. Whoa—a gratuitous dig at Dark City? Are you just trying to pick a fight with Roger Ebert? This reminds me of an essay on CTheory from back in 2000, where the author was musing on the transparency of the old iMac as a kind of sleight-of-hand to distract from the opacity of the technology itself. Even though we can see inside, almost nobody can say that they really understand what is actually happening within the computer. Interesting to contrast that with the strawbale house, which is something the great majority of people can grasp. 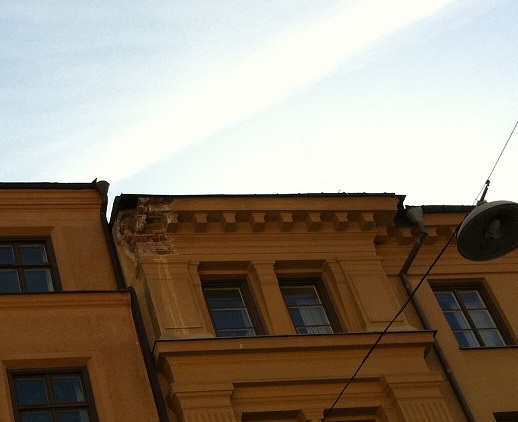 Thought about this post when I walked by this house in Stockholm today. Although it's not that surprising, the fact that it has been exposed/revealed to just be made of ordinary brick makes it a lot more interesting to me. I like the idea of the periscopes in the pavement. They would remind us that another world exists beneath our feet. On the other hand, transparency can diminish mystique and that's not always a good thing.